OK, so it's been almost two weeks since my last post, and it's probably bad form to blog about the "Rapture," and then disappear. 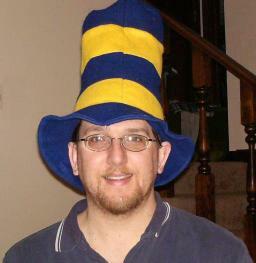 So, this is a retroactive notice that I will not be blogging for almost two weeks, starting May 16. My next post should appear on or about May 28. Furthermore, amid family time, work, getting outside more, and a couple personal projects I've taken on, I won't have a whole lot of time to blog in the foreseeable future. My goal, though, is to continue to write at least one post per week. If you're a computer geek, you may be interested in one of my projects -- a compiler for a virtual machine -- which I will be journaling here. Tim LaHaye and Jerry B. Jenkens have made an awful lot of money with their bestselling Left Behind series. And though the books are fiction, LaHaye and Jenkens have also authored a non-fiction book, Are We Living in the End Times? in which they attempt to show a biblical basis for the events of Left Behind. Critical to Jenkins and LaHaye's story line is the idea of a rapture of the faithful before things get too difficult. True believers will be snatched away into the clouds to be spared from hardship. Just how biblical are the Left Behind books, really? Just what does the Bible teach about the Rapture? Remarkably, this whole doctrine is taken from one word that appears in just one verse in one of Paul's letters near the back of the New Testament. The Greek word harpazo in verse 17 above is the equivalent of the English words "caught up" and the Latin word raptus, from which Rapture is derived. The word appears nowhere else in the New Testament. Rapture proponents also claim support elsewhere for this idea, most notably 1 Corinthians 15:50-51, Matthew 24:37-42, John 14:1-3, and Titus 2:13. I'll look at these in reverse order, just because I can. For the grace of God has appeared, bringing salvation to all men, instructing us to deny ungodliness and worldly desires and to live sensibly, righteously and godly in the present age, looking for the blessed hope and the appearing of the glory of our great God and Savior, Christ Jesus, who gave Himself for us to redeem us from every lawless deed, and to purify for Himself a people for His own possession, zealous for good deeds. These things speak and exhort and reprove with all authority. Let no one disregard you. The coming of Christ must occur in two installments because they are for two different groups of people and fulfill two different purposes. The first is the Rapture, when all living and dead Christians will be snatched up to be with Christ in the Father's house. The second is for all the people of the world, who will be judged for rejecting Christ. The first is secret, for a special group; the second is public, for everyone left on the earth. They are entirely distinct events! Dr. David Cooper often compared the Second Coming to a two-act play separated by a seven-year intermission (the Tribulation). The apostle Paul distinguished these two events in Titus 2:13 by designating them "the blessed hope and glorious appearing." And it doesn't get much better. Do not let your heart be troubled; believe in God, believe also in Me. In My Father's house are many dwelling places; if it were not so, I would have told you; for I go to prepare a place for you. If I go and prepare a place for you, I will come again and receive you to Myself, that where I am, there you may be also. Jesus tells his followers he will go prepare a place, then he will return. Most Christians, who believe Christ will return but do not believe in a Rapture, understand this verse quite differently from the way Rapture proponents read it. For those who believe in a secret Rapture, the words "I will come again and receive you to Myself," acquire an additional meaning. The idea is that Jesus could not come both to comfort his faithful and to judge the nations at the same time. Apparently that's too difficult a task even for the Messiah. At first glance, this passage looks like it may support the Rapture doctrine, with its talk about "one being taken" and all that. But what was it like in the days of Noah? Were the righteous taken away and the evildoers left on earth? It seems to me that it was the other way around. So maybe when Matthew says "one will be taken," he means taken away in judgment. Sometime during the wintder of 1997/98 I took a daytrip through the small towns of southwest Kansas with an old college friend. We arrived in Greensburg at 5:05 pm. 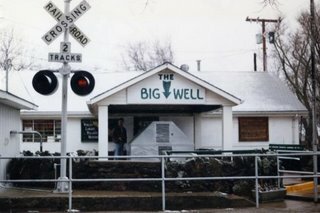 Greensburg is the site of the world's largest hand-dug well. At 32 feet in diameter, the mouth of the well was larger in square feet than the apartment where I was living at the time. 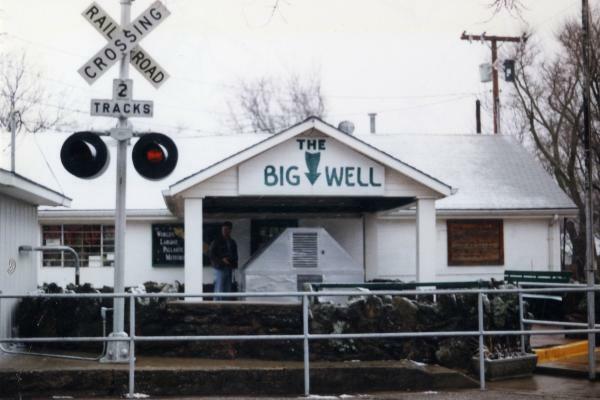 Next to the well was a gift shop, which also housed Greensburg's other claim to fame: the largest pallasite meteorite ever found. The gift shop closed at 5:00. We were five minutes late. Still, we were able to look through the cover of the well to see what a massive undertaking it must have been. Not as massive, though, as the tornado that ripped through the town Friday night. Nine people are dead and dozens more injured, and rescue workers expect to find even more bodies in the rubble. 90 to 95 percent of the town's buildings have been destroyed. It's the most devastating tornado this state has seen in probably eight years. I'm too stunned to write much more. The American Red Cross is accepting donations and welcoming volunteers. I'll post more links as I find other opportunities to give. On May 1, 2003, President Bush swaggered onto an aircraft carrier and announced that major combat operations in Iraq had ended. Four years and more than 60,000 civilian deaths later, combat operations continue. The U.S. has been involved in this war longer than it was in World War II, and no end is in sight. What's more, this is just one of many ongoing wars around the world. Other wars may not get the publicity of the Iraq War, but to their victims these wars are no less devastating. We are a violent species. Is there any hope for the human race? God of justness and mercy, we pray for an end to terrorism in any form. We pray for wisdom that will bring greater peace in our world. We pray for understanding and compassion that will safeguard the innocent and feed and find home for all refugees and all who suffer. We pray for companionship and strength for all who mourn. We pray in Jesus' love. Amen.